Losing your balance and falling in the home is unfortunately a common occurrence. Minimize anxiety with stainless steel grab bars that offer safety and stability. Our grab bar enables you to stand securely, and significantly helps in the transition from sitting to standing. In the home, straight safety bars are usually installed in the most used areas: next to the bed, near the kitchen table, by stairs to the garage or basement, and in the bathroom next the toilet and in the bathtub or shower. In commercial settings, angled grab bars offer security and stability in restaurants, schools, hospitals, nursing homes, and fitness centers. 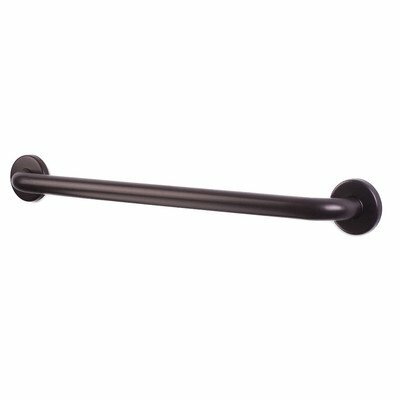 The oil rubbed bronze finish on this grab bar is easy to clean. Twist-on flanges conceal screws and provide a clean finished look. Our safety bar complies with all ADA standards and stands 1.5” from the wall, providing an easily accessible grip all around. Made of type 304 stainless steel tubing for strength and durability, our high-quality safety bar has a 1.25” outer diameter and measures 12". To secure grab bar to the wall, mount the flanges at the ends with the included screws. ADA-compliant grab bar supports more than 250 pounds when properly installed. CSI Bathware offers the finest-quality, commercial-grade grab bars at manufacturer-direct prices. Our grab bars are carried by the top bath and shower manufacturers in the USA and stand up to intensive usage in high-traffic hotels, hospitals and college dormitories. Buy with confidence with our 1-year warranty against any defects in material and manufacturing.